Arctic Frontiers started with a reception at the Fram-center in Tromsø on the 22nd of January. There were a number of different foods laid out, and they were both fancy and gorgeous and very mysterious. It so happened that I was standing next to a man who was equally perplexed by what this food was – so we had champagne and started testing the canapes. As we did, we started talking about the “weather” and suddenly ended on the topic of snow crab. He explained he was from Latvia and that they had recently stopped their snow crab activity because Russia had closed their continental shelf for harvest by anyone else but Russian fishers. I then started talking about my favorite subject, which is Svalbard and the Fisheries Protection Zone and the Continental shelf – and explained about the Norwegian institutionalization process of the zone, and how snow crab could become a catalyst for conflict in the Arctic, referring to my recently published article on snow crab in Ocean & Coastal Management with my colleage at Texas A&M at Galveston, Elizabeth Nyman. 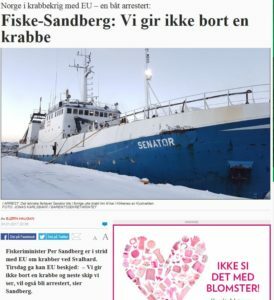 This was also reported on in Norwegian media, where Fiskeribladet Fiskaren reported that fiskeribladetfiskaren-24-1-2017 which translates to “Norway will not let itself be pressured by the EU”. 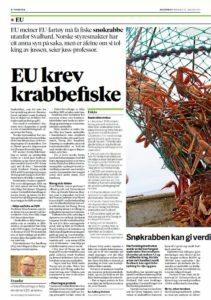 This came about as Tuesday, during Arctic Frontiers, the Norwegian Fisheries Minister, Per Sandberg, met with the EU commissioner for fisheries, Karmenu Vella to discuss the conflict. Sandberg emphasized that this was Norwegian continental shelf, and as such, it was under Norwegian jurisdiction. This is in fact a direct challenge to the Norwegian view of the Svalbard Treaty and the Fisheries Protection Zone – and the strict literal reading of the treaty that Norway has followed since its signing in 1920. This may be the critical juncture that forces a decision on this topic, in line with other articles that Tiller has also published about this topic. Tiller, Rachel Gjelsvik; Nyman, Elizabeth. 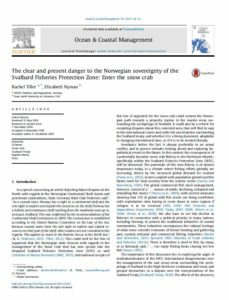 (2016) The clear and present danger to the Norwegian sovereignty of the Svalbard Fisheries Protection Zone: Enter the snow crab. Ocean and Coastal Management. Tiller, Rachel Gjelsvik; Nyman, Elizabeth. (2015) Having the cake and eating it too: To manage or own the Svalbard Fisheries Protection Zone. Marine Policy. vol. 60. Tiller, Rachel Gjelsvik; Hansen, Susanne Therese. (2013) International regime analyses in the northeast Atlantic. Journal of Environmental Studies and Sciences. vol. 3 (2). Tiller, Rachel Gjelsvik. 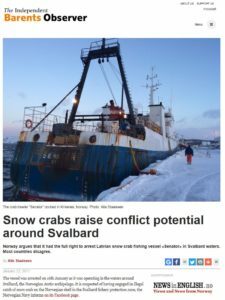 (2011) Institutionalizing the High North: will the harvest of redfeed be a critical juncture for the solidification of the Svalbard Fisheries Protection Zone?. Ocean and Coastal Management. vol. 54 (5). Tiller, Rachel Gjelsvik. (2010) Regime Management at the Bottom of the Food Web. The Journal of environment & development. vol. 19 (2). Tiller, Rachel Gjelsvik. 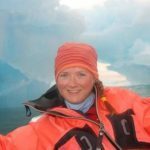 (2009) New Resources and Old Regimes: Will the Harvest of Zooplankton bring Critical Changes to the Svalbard Fisheries Protection Zone?. Ocean Development and International Law. vol. 40 (4).